The Bureau of Land Management (BLM) has spent an extreme amount of U.S. tax dollars to make a Spin-Doc to justify wild horse and burro removals while protecting THEIR jobs and the vast monetary interests of the oil, gas, water and mining corporations on public land. This slanted infomercial, they call an “internal premier”, will be aired today on the BLM internal Dish network. BLM employees are being brainwashed so they can respond to media investigations, Congressional inquiry and outraged members of the public with the BLM spin–feeling it’s “the truth” because they saw the documentary. Instead of providing government transparency, as requested by wild horse advocates and members of the public, the BLM has produced their Spin-Doc to avoid transparency all together. Will they mention the 2008 secret talks to kill thousands upon thousands of wild horses in holding or sell them to slaughter in their “documentary”? We hope BLM employees will see through the veil of subterfuge in the broken program that does not protect America’s wild horses but has a history of being involved in trafficking mustangs to slaughter since 1973. 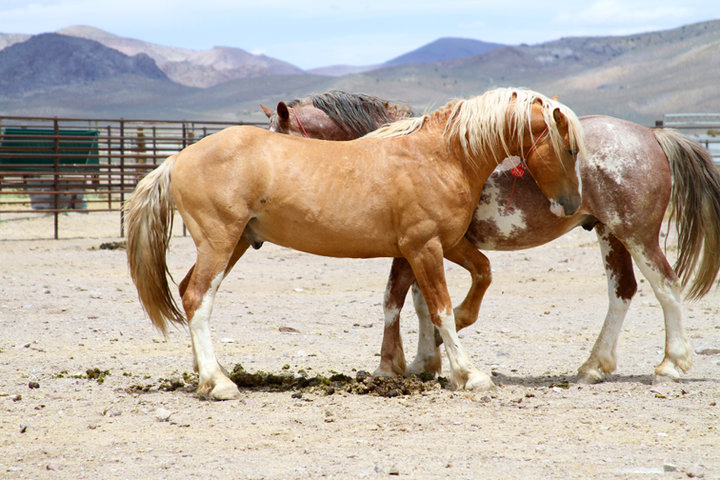 With BLM ramping up their efforts to sway internal, Congressional and public opinion, it’s time to take the offensive in this mission to save the mustangs and ask for what we want. Let’s promote the wild horse documentaries already out there (Cloud the Stallion, Wild Horses and Renegades, Saving America’s Horses and others) through our social media channels, friends as well as with other local and global opportunities. We can create buzz about the documentaries in post-production like Jan Liverence’s, Ellie Phipps Price’s, Wendy Malick’s and others. Members of the public along with wild horse and burro advocates can help new documentaries (short and long) get out there quickly by lending their support. Let’s power up. All groups and all wild horse advocates are all needed and deserving of support. Let’s find new ways to raise money for worthy projects and embrace the abundance in the Universe so we are united–knowing we will all have the money we need to accomplish our pledge to save American wild horses. Today we need to shout the truth louder than before–in new creative ways–circling the planet. Stop the roundups! Stop the removals! Stop selling wild horses to slaughter! Return wild horses from holding to the HMAs to heal the land–creating fertile rangeland–so all (livestock too) may prosper. Stop wasting tax dollars to fund the BLM’s broken Wild Horse and Burro Program–zeroing out America’s iconic wild horses. Save the mustangs now!